^ Robert S. Nelson. 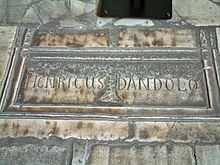 Hagia Sophia, 1850-1950: holy wisdom modern monument. University of Chicago Press. 2004年: 第80頁. ISBN 0226571718 （英语）. ^ Steven L. McKenzie、Matt Patrick Graham. The Hebrew Bible today: an introduction to critical issues. Westminster John Knox Press. 1988年: 第149頁. ISBN 066425652X （英语）. ^ John Binns. An introduction to the Christian Orthodox churches. Cambridge University Press. 2002年: 第57頁. ISBN 0521667380 （英语）. ^ Nurettin Can Gülekli. Hagia Sophia. Turkish Press, Broadcasting and Tourist Dept. 1952年: 第7頁 （英语）. ^ Rudolf Stegers. Sacred buildings: a design manual. Springer. 2008年: 第15頁. ISBN 3764366834 （英语）. ^ Michael Woods、Mary B. Woods. Seven Wonders of the Ancient Middle East. Twenty-First Century Books. 2008年: 第59頁. ISBN 0822575736 （英语）. ^ Richard C. Frucht. Eastern Europe: an introduction to the people, lands, and culture. ABC-CLIO. 2005年: 第853頁. ISBN 1576078000 （英语）. ^ National Geographic Society. National geographic. 第122冊. National Geographic Society. 1962年: 第848頁 （英语）. ^ Trudy Ring、Robert M. Salkin、Sharon La Boda. International Dictionary of Historic Places: Southern Europe. Taylor & Francis. 1996年: 第347頁. ISBN 1884964028 （英语）. ^ Matthew Bunson. OSV's encyclopedia of Catholic history. Our Sunday Visitor Publishing. 2004年: 第806頁. ISBN 1592760260 （英语）. ^ Jonathan Bardill. Brickstamps of Constantinople. 第1-2卷. Oxford University Press. 2004年: 第54頁. ISBN 0199255229 （英语）. ^ Dennis O'Neill. Passionate Holiness: Marginalized Christian Devotions for Distinctive Peoples. Trafford Publishing. 2010年: 第53頁. ISBN 1426925050 （英语）. ^ W. R. Lethaby、Harold Swainson. The Church of Sancta Sophia, Constantinople a Study of Byzantine Building. Kessinger Publishing. 2004年: 第18頁. ISBN 1417948396 （英语）. ^ Jane Taylor. 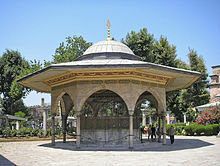 Imperial Istanbul: a traveller's guide, includes Iznik, Bursa and Edirne. Palgrave Macmillan. 1998年: 第49頁. ISBN 1860642497 （英语）. ^ Edward N. Luttwak. The Grand Strategy of the Byzantine Empire. Harvard University Press. 2009年: 第115頁. ISBN 0674035194 （英语）. ^ W Emerson、RL Van Nice. Hagia Sophia and the First Minaret Erected after the Conquest of Constantinople. American Journal of Archaeology. 1950, 54 (1): 28–40 （英语）. ^ Fatih Cimok. Saint Sophia. A Turizm Yayinlari. 2009年: 第51頁. ISBN 9757199451 （英语）. ^ James Allan Stewart Evans、J. A. S. Evans. The age of Justinian: the circumstances of imperial power. Routledge. 2000年: 第217頁. ISBN 0415237262 （英语）. ^ Association of Collegiate Schools of Architecture. Proceedings of the ACSA annual meeting. Association of Collegiate Schools of Architecture. 1986年: 第150頁 （英语）. ^ Emerson Howland Swift. Hagia Sophia. Columbia University Press. 1940年 （英语）. ^ Gian Pietro Brogiolo、Nancy Gauthier、Neil Christie. Towns and their territories between late antiquity and the early Middle. BRILL. 2000年: 第327頁. ISBN 9004118691 （英语）. ^ W. Eugene Kleinbauer、Antony White、Henry Matthews. Hagia Sophia. Scala Publishers. 2004年: 第33頁. ISBN 1857593081 （英语）. ^ 26.0 26.1 Cynthia Stewart. The Catholic Church: A Brief Popular History. Saint Mary's Press. 2008年: 第138頁. ISBN 0884899675 （英语）. ^ Will Pryce. World Architecture: The Masterworks. Thames & Hudson. 2008年: 第48頁. ISBN 0500342482 （英语）. ^ John Francis Baldovin. The urban character of Christian worship: the origins, development, and meaning of stational liturgy. Pont. Institutum Studiorum Orientalium. 1987年: 第175頁 （英语）. ^ Manolēs Chatzēdakēs. 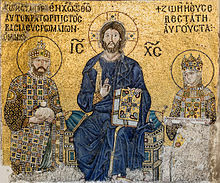 Studies in Byzantine art and archaeology. Variorum Reprints. 1974年: 第10頁. ISBN 0902089242 （英语）. ^ American Philological Association、Philological Association of the Pacific Coast. Transactions and proceedings of the American Philological Association. 第78冊. Published for the Association by the Press of Case Western Reserve University. 1947年: 第182頁 （英语）. ^ Emmanuel P. Baltsavias、Manos Baltsavias、Armin Gruen、Luc Van Gool、Maria Pateraki. Recording, modeling and visualization of cultural heritage. Taylor & Francis. 2006年: 第55–56頁. ISBN 041539208X （英语）. ^ John Freely. The companion guide to Istanbul and around the Marmara. Companion Guides. 2000年: 第30頁. ISBN 1900639319 （英语）. ^ İlhan Akşit. Ancient civilisations of Anatolia and historical treasures of Turkey. G. Sanatlar. 1982年: 第226頁 （英语）. ^ Robert F. Taft. The great entrance. Pont. Institutum Studiorum Orientalium. 1975年: 第110頁 （英语）. ^ R. Scott Peoples. R. Scott Peoples. Wildside Press LLC. 2008年: 第27頁. ISBN 0809572214 （英语）. ^ Stavros Boinodiris、Stavros Boinodiris PH D. Andros Odyssey: Byzantine Kalivarion:705 Ad-1078 Ad. iUniverse. 2004年: 第131頁. ISBN 0595320147 （英语）. ^ Kenneth Parry. Depicting the Word: Byzantine iconophile thought of the eighth and ninth centuries. BRILL. 1996年: 第179頁. ISBN 9004105026 （英语）. ^ Semavi Eyice. Ayasofya. Yapı ve Kredi Bankası. 1984年: 第38頁 （英语）. ^ John Julius Norwich. Byzantium: the apogee. Viking. 1991年: 第96頁 （英语）. ^ Jonathan Harris. Constantinople: capital of Byzantium. Hambledon Continuum. 2007年: 第131頁. ISBN 184725179X （英语）. ^ David Talbot Rice. Byzantine painting: the last phase. Dial Press. 1968年: 第29頁 （英语）. ^ Kenneth Meyer Setton. The Papacy and the Levant, 1204-1571: The Thirteenth and fourteenth centuries. American Philosophical Society. 1976年: 第13頁. ISBN 0871691140 （英语）. ^ Pedro Tafur. Travels and Adventures. Routledge. 1926年: 第138–148頁 （英语）. ^ G. Gerola. Le vedute di Costantinopoli di Cristoforo Buondemonti. 1931年: 第247–279頁. ^ Baron Patrick Balfour Kinross. Hagia Sophia. Newsweek. 1972年: 第107頁 （英语）. ^ I. Mungan. Hagia Sophia and Mimar Sinan. Taylor & Francis. 2004年: 第383–384頁. ISBN 9058096424 （英语）. ^ W. Eugene Kleinbauer、Antony White、Henry Matthews. Hagia Sophia. Scala Publishers. 2004年: 第106頁. ISBN 1857593081 （英语）. ^ Justin Pollard. Wonders of the ancient world: antiquity's greatest feats of design and engineering. Quercus. 2008年: 第167頁 （英语）. ^ Hagia Sophia. archnet. [2010-05-29]. （原始内容存档于2009-01-05） （英语）. ^ Spencer P.M. Harrington. Restoring the Hagia Sophia. .archaeology. June 2, 1998 [2010-05-24] （英语）. ^ 17-year-old scaffolding removed from Hagia Sophia Museum. Today's Zaman. 27 January 2010. （原始内容存档于2015年6月2日） （英语）. ^ Shaun Tougher. The reign of Leo VI (886-912): politics and people. BRILL. 1997年: 第123頁. ISBN 9004108114 （英语）. ^ 王其钧. 永恒的辉煌——外国古代建筑史. 北京: 中国建筑工业出版社. : 91–92. ISBN 7112076404 （中文）. ^ Fred S. Kleiner、Christin J. Mamiya. Study guide for Gardner's Art through the ages. Thomson/Wadsworth. 2004年: 第331頁. ISBN 0534640966 （英语）. ^ St. Sophia Touring. explore turkey. [2010-05-22]. ^ HAGIA SOPHIA MUSEM. english.istanbul. [2010-05-22]. （原始内容存档于2010-02-18） （英语）. ^ Fred S. Kleiner. Gardner's Art Through the Ages: The Western Perspective. Cengage Learning. 2009年: 第235頁. ISBN 0495573604 （英语）. ^ In the Hands of a Child. In the Hands of a Child Grades 6-12, Project Pack Materials & Structures. In the Hands of a Child. : 第12頁 （英语）. ^ Hagia Sophia. explor eistanbul. [2010-05-20]. （原始内容存档于2010-03-16） （英语）. ^ Fatih Cimok. Saint Sophia. A Turizm Yayinlari. 2005年: 第65頁. ISBN 9757199451 （英语）. ^ Roy Bolton. Russian Orientalism: Central Asia & the Caucasus. Sphinx Fine Art. : 第160頁. ISBN 1907200002 （英语）. ^ 79.0 79.1 St. Sophia Main Body. explor eistanbul. [2010-05-22] （英语）. ^ Istanbul - Hagia Sophia Museum Mahmut I Library. turkey holidays guide. [2010-05-20]. （原始内容存档于2010-04-13） （英语）. ^ Sultan's Lodge. [2010-05-20] （英语）. ^ Al Altan. Visiting Hagia Sophia Museum. focusmm. [2010-05-21] （英语）. ^ John Renard. Seven doors to Islam: spirituality and the religious life of Muslims. University of California Press. 1996年: 第136頁. ISBN 0520204174 （英语）. ^ Natalia Teteriatnikov、Dumbarton Oaks. Mosaics of Hagia Sophia, Istanbul: the Fossati restoration and the work of the Byzantine Institute. Dumbarton Oaks Research Library and Collection. 1998年. ISBN 0884022641 （英语）. ^ Karen Tate. Sacred Places of Goddess: 108 Destinations. CCC Publishing. 2006年: 第99頁. ISBN 1888729112 （英语）. ^ Robin Cormack、Ernest J. W. Hawkins. Dumbarton Oaks papers, Issue 31. Dumbarton Oaks Center for Byzantine Studies. 1977年: 第238頁 （英语）. ^ Robin Cormack. Icons. Harvard University Press. 2007年: 第48頁. ISBN 0674026195 （英语）. ^ Lord Kinross. Hagia Sophia: A History of Constantinople. Newsweek. 1972年: 第132–133頁 （英语）. ^ Anonymous. Istanbul 1993. Keskĭn Color Kartpostalcilik. 2003年: 第36頁 （英语）. ^ Rosie Ayliffe. The rough guide to Turkey. Rough Guides. 2003年: 第118頁. ISBN 1843530716 （英语）. ^ Mosaics. .hagia-sophia.net. [2010-05-17] （英语）.